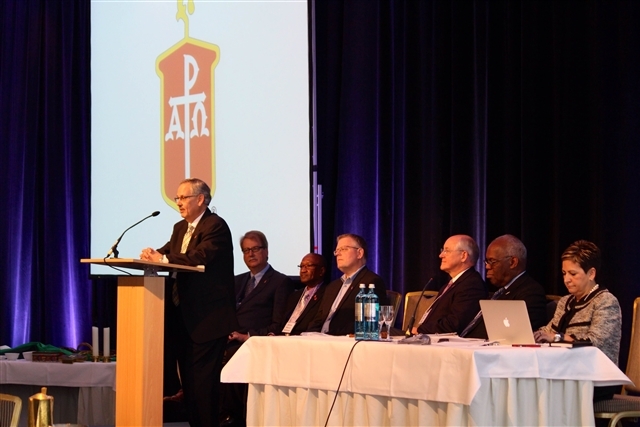 As they met in Berlin, on May 2 the Council of Bishops of The United Methodist Church re-elected Bishop Cynthia Fierro Harvey as secretary for the COB. While at the meeting, Bishop Harvey preached at the United Methodist Church in Eberswalde, which is in former East Germany. The congregation is served by pastoral couple Revs. Matt Barlow and Anne-Marie Detjen, pictured right with the bishop. Also pictured is GBGM missionary Alyson McCoy who is assigned to a ministry in Frankfurt, Germany. An interesting aside . . . Alyson hails from Haynesville, La. and Anne-Marie and Matt attended Wesley Seminary in Washington, DC and are friends of Rev. Drew Sutton! The bishops elected as officers of the Council include Bruce R. Ough, Dakotas-Minnesota Episcopal Area, as president; Kenneth H. Carter Jr., Florida Episcopal Area, president designate; Cynthia Harvey, Louisiana Episcopal Area, secretary; Christian Alsted, Nordic and Baltic Episcopal Area, Connectional Table chair; Marcus Matthews, Washington Episcopal Area, executive secretary; and Michael Watson, North Georgia Episcopal area, ecumenical officer.